Todd taught us about generative methods, which turned out to be pretty familiar territory from my math studies. In geometry, they are called transformations, and they describe the mapping of geometric forms in space. In class, we discussed four methods/transformations in particular: translation, rotation, reflection, and glide reflection. Translation shifts all points of a figure in space the same distance, so the end result is moving the figure to some other location. Rotation shifts a figure around a fixed point. Reflection creates the mirror image of a figure over an axis. Glide reflection is the combination of a translation and a reflection, i.e. it is a shifted mirror image of the figure. I wanted to incorporate found materials (read: stuff that I have at home) into my project, and one thing I happen to have a lot of is old shirts. 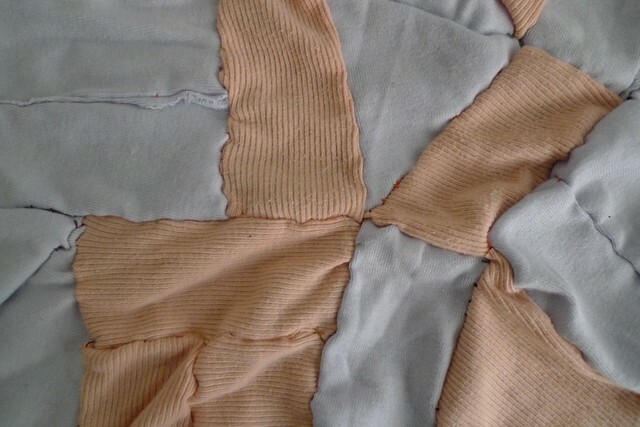 I chose two ratty old shirts, one pale orange and one periwinkle, and proceeded to cut them into easily transformable shapes (triangles and rectangles). 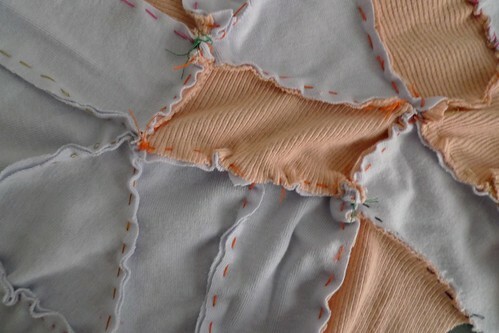 I then decided on a pattern: reflection, rotation, translation. 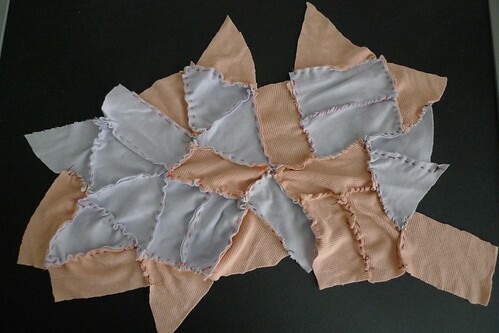 I picked a matched pair of fabric shapes from the pile, carefully alternating between the colors and shapes. 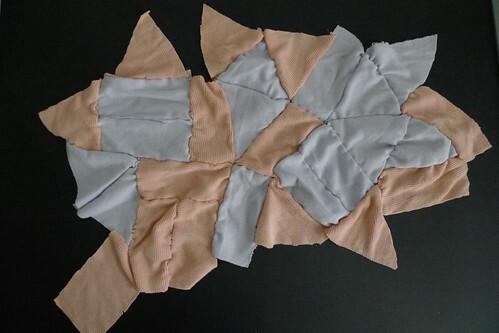 I then sewed the shapes to the quilt according to the transformation order.